It’s that time of year again… tax season. As I’m sure you are all aware, taxes are due in 5 days. Depending on your financial situation and portfolio composition, this can be a stressful time of year as you are digging through documents to make sure you include every single deduction you possibly can. 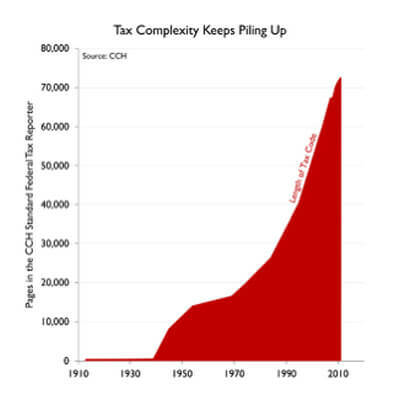 While we all scramble to get this done on time while minimizing the amount we owe, how many people have even read the tax code in its entirety? If you haven’t, like nearly the entire population, don’t feel guilty because the current version tax code is roughly 4 million words. To put this into perspective, consider that the Bible (both New and Old Testament) is 788,280 words, meaning the United States Tax Code is more than five times longer than the Bible! Because of this, having a knowledgeable CPA or a well thought out tax strategy can be nearly as important as your actual investment selection. After all, the highest income tax bracket is 44.14% (39.6% Federal and 4.54% Arizona). For our California investors paying in excess of 10% in state taxes… I really feel your pain. However, while we loathe paying taxes, it’s actually much better than getting a refund. Sounds crazy but stick with me here. When you receive a tax refund at the end of the year, you’ve essentially granted the government an interest free loan for the year. Considering that you could’ve had that capital earning you money the whole time, it’s a real cost to your bottom line. If you are receiving a sizable refund this year, I’d recommend considering to drop the amount withheld from your pay. Focus on asset location – Where you keep your investments has a huge effect on taxation. While there are many vehicles to keep your assets, for the sake of this article I’ll only discuss owning in a tax deferred account (i.e. 401k, IRA, etc…) vs. owning personally. A tax deferred account will accumulate tax free until you liquidate the investments at a later date, meaning you won’t have an annual tax bill on your gains. You may want to consider keeping investments which turnover frequently and/or those which are taxed at the ordinary income tax rate in this type of account. Investments that turnover frequently, such as many mutual funds, will realize gains anytime one of its components is traded, triggering the much higher short term capital gains rate. However, even with this great benefit you likely don’t all of your investments in a tax deferred account. First, if you have a liquidity need, the cost of removing funds early is very high (this typically applies if you remove before the age of 59½) as there are early removal penalties. You also don’t want to place an investment taxable at long term gains in a tax advantage account as you may inadvertently trigger the higher ordinary income tax rate when you sell. Tax Loss Harvesting – Tax loss harvesting is the practice of selling an investment that has experienced a decrease in value. Although it seems counterintuitive to sell low, by “harvesting” this loss you can lower your taxable income and ultimately your taxes paid. By getting rid of a perpetual loser and replacing it with a new investment, you will end up with more money at the end of the day with the new appreciation and taxes saved. Plan Ahead – Regardless of your plans for wealth succession, there are many factors you may want to consider. Depending on what you intend to pass on, you may leave your heir with a much lower amount than intended due to hefty estate taxes. If you pass down an asset which is not intended to be liquidated, such as a home for one of your children, the heir might have their own financial hardship simply finding the funds to pay the estate taxes associated with it. For these situations life insurance could be a viable solution to ensure estate taxes are taken care of. This will help make sure your heirs don’t have the added stress of figuring out how to pay the large taxes associated with inherited assets. While we always advise consulting a tax professional, I thought some of these may be something helpful you want to consider speaking with them about. It can be a stressful time of year but having a strategy can go a long way towards keeping more of your hard earned money in your pocket.